Every organization must deal with purchase orders (POs) in some capacity. 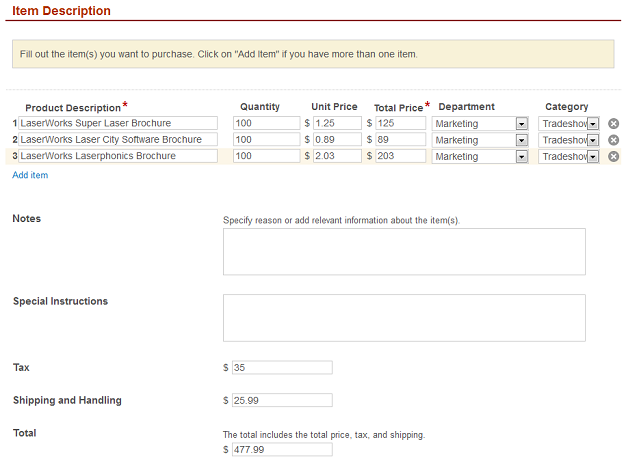 Here is how to make the purchase order process completely paperless with Laserfiche Forms. The marketing department at LaserWorks outsources printing of product brochures to an outside vendor. A tradeshow is coming up and the company wants to hand out three brochures about its most popular products at the show. The previous process involved an event assistant filling out a purchase order form by hand, and then delivering it to the marketing events manager who reviewed it and signed it. This paper PO would then wend its way through the marketing and accounting departments before finally being completed, approved and filed. We’ve streamlined this time-consuming and inefficient process with Laserfiche Forms. The events assistant fills out the PO with the required information. As she inserts quantities and unit prices of the brochures, the “Total Price” field is automatically filled out with the correct subtotal. When she adds in the sales tax and shipping/handling charges, the “Total” is automatically calculated. Once the form is completely filled out, the events assistant clicks “Submit” and the form is routed to the events manager for approval. The events manager must look over the form and sign it. She can also designate another manager to approve and sign the form. In this case, Mindy Manager has designated Michael Marks, marketing manager. The form will be routed to Michael for his review. After this review step, the PO is sent to the accounting manager. Once the accounting manager approves the PO, it is automatically sent to the accounting clerk who generates a PO Number and fills in the appropriate field on the form. 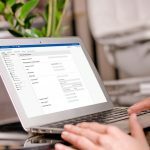 If the invoice has already been uploaded, the events assistant receives an e-mail with the PO number. If she has not yet uploaded the invoice, she automatically receives the form below. The form and attachments are then routed to the accounting manager for final review. Once the review is complete, the accounting clerk mails payment to the vendor and the form and its attachments are sent to a specific folder in the Laserfiche repository for final storage. Although the final document is a single PO, the process actually contains of four different forms. 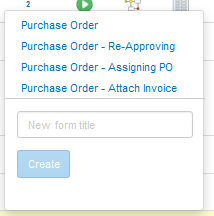 Information from the first form (the original PO form that the events assistant filled out) is copied to each of the other forms, with additional fields for each review step. 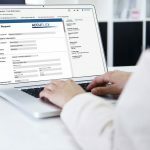 For example, the form that the accounting manager sees is not the original PO form but the PO form with the special “Manager Section” appended to the bottom. 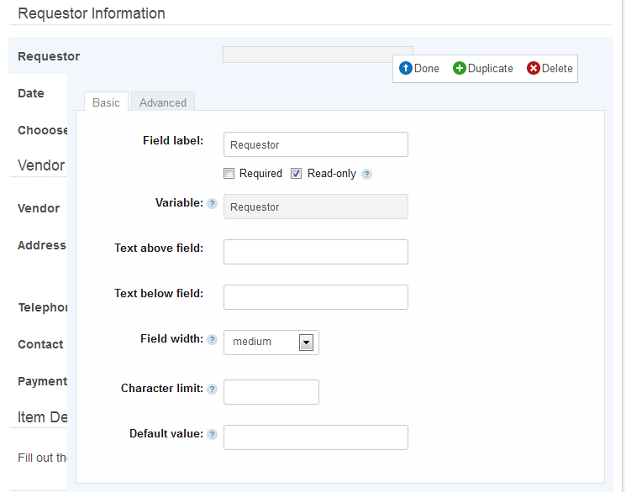 When creating the form that the accounting manager sees, instead of inserting a regular field and calling it “Requestor,” we can simply insert the “Requestor” variable. This ensures that that the field will be populated with the same information entered in the original PO when the accounting manager views it. This code relies on the presence of CSS classes on specific fields. Be sure to add the appropriate CSS class to your fields or the code won’t work. Exact code and instructions can be found in the Laserfiche Forms online help files. Actions performed by people, such as “Assign PO #,” are represented by user tasks; actions performed by automated tools, such as “Sent PO # to Requestor,” are represented by service tasks; and routing decisions are represented by gateways. 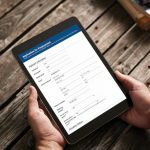 Purchase orders can be signed electronically and easily routed from party to party without having to be manually carried around the office. Everything can be done in an efficient and timely matter as everyone involved is notified immediately of their upcoming tasks. • Administrators can easily see where each PO is in the process and the duration of each process step. If there’s a problem or slow-down, it’s easy to identify and correct that part of the process.